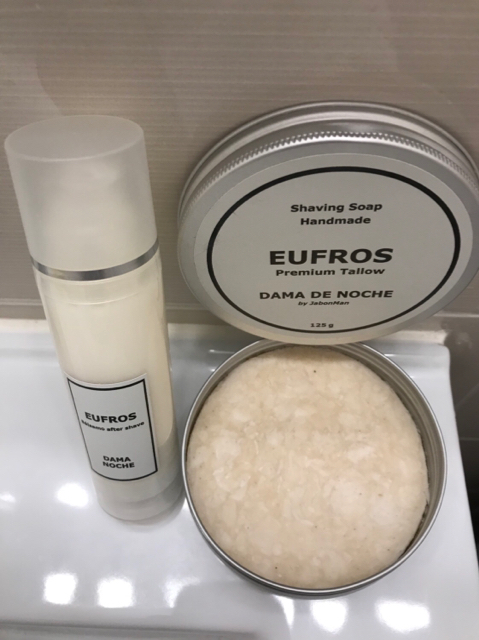 SOLDFor sale or trade here is a Jabonman Eufros Premium Tallow shave soap + AS balm set in Dama de Noche scent. Sensational performance and scent. Balm used 2x, and soap lathered a few times (see pic of weight below, 125g new). Retail in $USD is approximately $42 + cost of international shipping. Offered here for $40 shipped, CONUS only. Might consider trades for new B&M soaps or matching sets (especially Dickens or Cheshire), or new Mike’s. This is a great deal. I already have the Dama de Noche soap, and don't use balms, but otherwise I'd be all over this. Dama de Noche is one of the finest floral scents I've used, and the soap performance is amazing. Good luck! Small price drop vs original post to $40 shipped. I’ll take them please. Pm coming.